For companies looking to add an eerie (but fun) touch to their respective brands, here are 6 Spooktacular branding ideas for Halloween. 1—Carve out a custom Halloween logo: When it comes to your brand, there is nothing more set in stone than your logo and your brand colors. Remaining consistent with these elements is what separates a well-managed brand from a weak, utterly forgettable one. However, when it comes to holidays like Halloween, it’s ok to bend the rules a bit. Why not replace the “O” in your name with a jack-o-lantern? Or replace that red and blue with orange and black? If your tagline says “We Are the Experts,” change it to “We Were the Experts.” It’s ok to have some fun with it. Just remember to change it all back on November 1. 2—Get Spooktacular on multiple platforms: Refashioning your company logo for Halloween is a great way to endear your brand to your customers and celebrate the spooky spirit of the holiday, but why not take it a step further? Make sure your Halloween branding carries over to your company’s website and social media pages as well. Remember that branding supports your marketing efforts so get creative. Cisco estimates that video will make up 80% of internet traffic by next year. Try utilizing branded Halloween-themed videos as content for Instagram or Facebook. 3—Create bewitching packaging: Every touchpoint with your customer is an extension of your brand. While you’re at it, expand the holiday theme to your product packaging. If you’re on a budget, try something as simple as printing content on orange paper or using themed packaging tape. Jack-o-lanterns or pumpkins perhaps? And there’s no need to purchase all new boxes and bags. Stickers can be a cost-effective way to add a bit of Halloween fun to all of your items. 4—Create a spellbinding new voice: Your brand already has a voice and it’s usually crucial that it stays consistent in all your writings. But when it comes to Halloween, or any other holiday for that matter, it’s ok to play along. Without getting too creepy, feel free to use your delicious brains and inject a little Halloween humor into your brand voice for the occasion. 5—Offer a Franken-tastic promotion! Contests can be an excellent way to attract customers and entice people to interact with your brand, especially when your promotions tie into special occasions and holidays like Halloween. People just love to win giveaways, discounts, and prizes so even if your budget is limited, there are plenty of fun, low-cost ideas that won’t hurt your wallet while still earning a monster-sized return. 6—“Creep” it real with public art: Consider teaming up with local artists to create fun street art, such as holiday-themed murals or sidewalk chalk art. In the digital age, this is bound to stand out and earn some well-deserved attention from all the walkers. As we close out National Cybersecurity Awareness Month, this is a reminder from SCORE that 43% of cyberattacks target small businesses. The infographic below tells you what you need to know. Most (91%) of small business employees are optimistic about the future of small business, though they still believe there’s room for improvement on key areas, such as equal pay. This according to the 2018 Small Business Happiness Survey from voluntary insurance leader Aflac. Only 30% of small business employees surveyed think the industry has achieved complete success when it comes to equal pay. Of the same group, 22% say little to no success has been achieved, and 48 % say success has been achieved but there is still room for growth. 91% believe employee happiness is at least somewhat important to their company’s leadership. In fact, 55% say employee happiness is very important to their leadership. The increasing desire to solve gender issues also aligns with recent findings from the Aflac CSR Survey, which surveyed employees from all businesses. Of that group, 60% of women say paying men and women equally for the same work should be among a company’s top priorities. Additionally, 26% of HR managers surveyed believe their companies pays men more than women for the same work. It’s a given consumers do business with people they know, like and trust. So, how do you get people to like you? The infographic below from QuickQuid explains all. Sale prices of businesses sold in the 3rd-quarter of 2018 reached new highs, according to a report from BizBuySell.com, the internet’s largest business-for-sale marketplace. Sale prices are directly related to stronger business financials which also hit new levels in Q3. With buyers able to offset increasing prices by acquiring healthier businesses, the result is a well-balanced market. Small businesses sold for a median price of $249,000 in the 3rd quarter, up 10.7% from the same time last year and the highest amount since BizBuySell started collecting data in 2007. The median asking price grew 7.6% to $269,000 which translates to a 93% sales-to-ask ratio, up slightly from the 92% reported in Q3 2017. The strong sales-to-ask ratio likely means that buyers and sellers are seeing eye-to-eye in terms of value. While owners are getting top dollar for their businesses, buyers are inheriting businesses with a better financial footing. Primarily fueled by a healthy economy, businesses sold in Q3 had $530,995 median revenue and $116,229 median cash flow. Those financial totals are up 7.4% and 2.8% respectively y/y. Businesses added to the market in the 3rd quarter continue to display impressive financials, which should be great news for buyers. The median revenue and cash flow of listed businesses grew 4% and 5% respectively year/. Q3 listing data provides a similarly positive outlook for owners looking to sell. The median asking price of business listed for sale in Q3 reached $279,000, up 3.3% vs. a year ago. Assuming a similar 93% bid-to-ask ratio, business listed in Q3 are on pace for a median sale price of $259,470, which would be the highest amount in BizBuySell history. BizBuySell’s 2018 Buyer-Seller Confidence Index supports the idea of an equally beneficial market to both buyers and sellers. In fact, buyers are slightly more confident in today’s business-for-sale market than last year. While seller confidence remains unchanged compared to 2017, 60%of owners said they are confident they would receive an acceptable sales price if they exited today. Only 6CEOs graduated from Ivy League schools. Fewer than half (21) went to private schools. 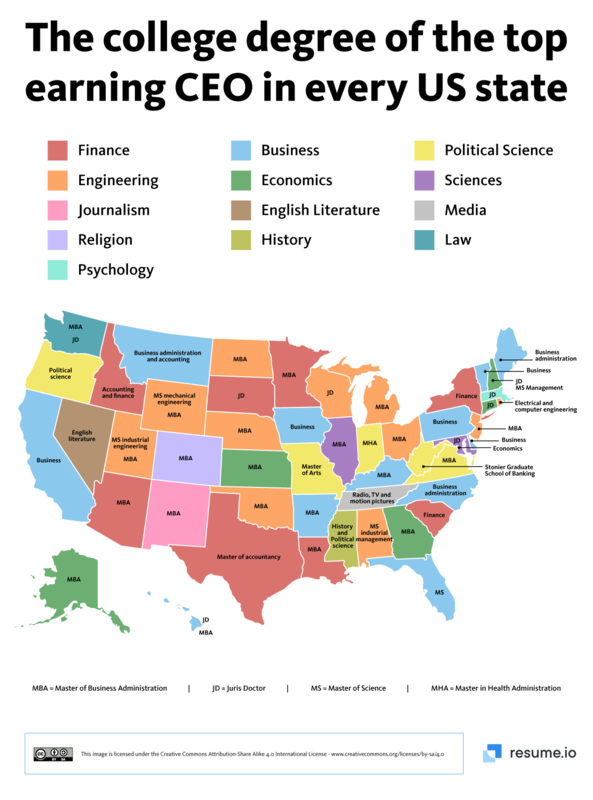 Study areas range from accounting to religion, but most majored in business (37%) or engineering (22%). Take a look at the infographic below from Resume.io to see what the nation’s top-earning CEOs majored in in college. AWeber, in celebration of 20 years helping small businesses and nonprofits grow through email marketing, just announced its Small Business, Big Impact Award. Since AWeber introduced email automation to the market in 1998, thousands of small businesses and nonprofits have leveraged the power of its email marketing and automation platform to build stronger relationships with their customers and communities. “Ever since I started AWeber 20 years ago, our main mission has been to help small businesses and nonprofits connect people in remarkable ways,” says Tom Kulzer, AWeber’s founder and CEO. The entry period ends January 4, 2019. To learn more and to enter the Small Business, Big Impact! Award contest, go here. There’s more information on this blog, and at the contest website. Have you outgrown your webhost? Take a look at the infographic below from HostGator to see if you need to immediately find a new webhost. BigCommerce just released its 3rd annual Omni-Channel Retail Report. The emphasis is on generational differences in shopping behaviors. According to the report, “Gen Z is the new segment for rising brands and apps to capture loyalty.” And Gen Z is different than prior generations—“The ability to touch and try on a product before purchase is less and less of a concern. Instead, brand coverage, social media presence and overall lifestyle affinity wins Gen Z from their one-click purchase on Amazon or through the newest drop app.” Plus, they influence how their older generations shop. There’s a lot of information here. Want to know where the different generations shop online? Only 9.6% of Gen Z reports buying items in a physical store—considerably less than their older generations (millennials at 31.04%, Gen X at 27.5%, and baby boomers at 31.9% respectively). Gen Z also spends little on products they find from Facebook—11.8% compared to millennials at 29.39%, Gen X at 34.21% and baby boomers at 24.56%. Both millennials and Gen Z spend the majority of their shopping dollars on products they find on Instagram and Snapchat. There’s a lot more. Check out the blog. And you can download the report for free. We’re living in volatile times. Randstad US just released results of a survey uncovering U.S. employees’ feelings and experiences with political discussions in the workplace, and how an employer’s approach to political issues can influence employee engagement and retention. The data shows 49% of respondents enjoy talking politics with colleagues because it helps them understand other viewpoints, while 53% admit limiting social interactions with coworkers who have differing political beliefs. Employers should foster an open dialogue and put guidelines governing political expression in place. For more information, check out finding the right approach to political expression at work. All that said above, as the business owner, you can encourage your employees to vote, without taking a stand on parties or issues. TriNet explains how on their blog. Despite having one of the world’s most advanced economies, the United States lags far behind other countries when it comes to paid parental leave. The team from SimplyHired took a closer look at how parental leave policies vary across different industries in the country. Government and public administration industries offer the greatest number of days of paid parental leave—30 for men and 40 for women. New parents working in manufacturing had some of the smallest number of paid leave days—14 for men and 10 for women. Mothers earning less than $100k received far less paid maternity days (15-17) than those earning over $100k (25-30). Here’s the full study from SimplyHired. Employees who aren’t “excited” about their jobs are more tempted push snooze in the morning and spend some extra minutes in bed. The team from Best Mattress Brand studied over 1,000 people to compare how long they slept in to their early morning productivity and overall satisfaction. There are so many factors, from room temperature to quality of their mattress that affects sleeping habits. Check out this post to learn lots more. Over the past five years, more small businesses have established flexible work schedules, telecommuting, and wellness programs to help employees improve their work-life balance. For small businesses already applying these practices, the study confirms it makes a difference—55% of workers who feel their employers care about their well-being want to stay at their companies for 10 years or more compared to 33% who don’t believe their companies care. Many employees feel their benefits are important to their household’s financial security and higher out-of-pocket medical costs impact workforce well-being. Small businesses are responding by filling the gap and increasing their supplemental health insurance offerings: 38% offering accident insurance (up 15% since 2015), 25% offering critical illness insurance (up 14% since 2015), and 21% offering hospital indemnity insurance (up 24% since 2015). Cloud-based software has made human resources and benefits technology more accessible to small businesses. The Guardian study found more than 50% of small businesses have digitalized a majority of their benefits process. Small business owners are not as tax savvy as they think they are, according to a survey from Clutch, the leading B2B research, ratings, and reviews company. In fact, 30% of small businesses believe they overpay their taxes and could claim more deductions and credits. This, despite the fact 93% rate themselves as “very” or “somewhat confident” in their abilities to accurately file taxes. Clutch surveyed small business owners and managers who are involved in their businesses’ financial decisions to determine how they manage their finances and where they fall short. Small businesses can benefit from seeking outside help for their taxes, even if they think it isn’t worth the cost, say accounting experts. It can also benefit small businesses to seek help for other financial processes. While 95% of small business owners say they are “confident” or “very confident” in the accuracy of their overall financial records, experts say these same small businesses often don’t recognize or understand when mistakes are being made. “[Small business owners] can think that they’re fine. Then, they have someone skilled look at their balance sheet, their profit & loss, and say, ‘Hey, this is missing or this isn’t categorized correctly,’” Medina said. Small businesses should keep separate bank accounts: 27% of business don’t keep their personal and business finances in separate bank accounts. While this can work for some businesses, it’s typically not recommended and is potentially risky, say experts. Separating bank accounts decreases the likelihood of errors, adds Rhett Molitor, co-founder of Basis 365 Accounting, a cloud-based accounting service. This separation can benefit the 23% that have experienced challenges with mixing business and personal finances in the past year. Paid time off (PTO) has quickly become one of the most popular employee benefits. Learn how to create a PTO policy for your small business at this free one-hour webinar from TSheets and Namely. How to Craft a PTO Policy That Works for Everyone will be presented November 7 at 3pm ET and 12 noon PT. Employee paid time off experts Robin Wilson (from Intuit), Michael Goldberg (from Namely) and Jessica Greene (also from Intuit) will lead the discussion, which will appeal to anyone with an interest in employee benefits or human resources. Whether you’re a business owner, HR professional or accountant, this is your chance to ask three employee benefits experts about how you can maximize your PTO policy to benefit both the employee and employer. The third season of Small Business Revolution – Main Street, an online series from Deluxe Corporation has debuted. Each season showcases the $500,000 revitalization of one small town and its small businesses. The third season’s eight episodes chronicle the community and small businesses of Alton, Illinois. For the first time, all of the season’s episodes are being released simultaneously and they’re now streaming at SmallBusinessRevolution.org, Hulu and on YouTube. Season 3 illustrates how the Deluxe team of small business marketing experts helped revitalize six selected businesses and the Alton community. This year’s small business transformations range from a mother-and-son duo operating a beloved, yet still-struggling soul food restaurant, to a pet groomer who provides exceptional customer service but works around the clock, to young business partners seeking to move their music studio into a larger space. Each business faced unique challenges—some were on the verge of shuttering entirely—and Deluxe experts helped position them for success. Now, the public is invited to nominate the town they believe should win Deluxe’s next $500,000 Small Business Revolution revitalization. Deluxe provided a range of marketing services with advice from Deluxe marketing experts, renovation icon Ty Pennington and six female business leaders who are nationally recognized as experts within their respective fields. Working together, the full cast tackles business, cultural and economic challenges facing the unique community of Alton, while providing advice that is applicable to small businesses and communities of all sizes throughout the country. “My career has focused on helping transform individual people’s homes and lives, and joining Small Business Revolution – Main Street gave me the opportunity to help Deluxe transform an entire community,” says Pennington. In each episode of Season 3, the Deluxe marketing team and Pennington tackle, business and personal issues facing small business owners and community leaders. The series captures the struggle to run a business in a small town and the triumph of a community coming together. Deluxe, a leading provider of small-business marketing and financial services, launched the Small Business Revolution – Main Street contest in 2016. You can get more information here. The series is distributed nationally to more than 350 PBS stations, Create TV Network and World Channel nationwide and is shown in over 96% of the country. As well as shining a spotlight on these entrepreneurs, the creators of START UP are also working with one of the show’s lead sponsors, Vistaprint, to support small businesses and help them look professional across all their marketing. Vistaprint’s design and product teams worked with selected small business owners to provide them with a complete rebrand. The brand transformation of these businesses was captured in four unique episodes that will be distributed via Vistaprint’s social platforms. In its sixth season, START UP features small business owners in Omaha, Lincoln, Kansas City, Tulsa, Broken Arrow and Fayetteville. Thinking of starting a nonprofit. Here’s a great guide: The Beginner’s Guide: How to Start a Nonprofit Organization. The average worker has five friends at work, according to a survey from Olivet Nazarene University. There’s a lot of information here that’s useful for anyone trying to manage a happy, productive workforce. Intuit recently announced two new programs for business. 1—QuickBooks® Online Advanced, a cloud-based offering designed for high-growth businesses. By bringing together its 3.4 million online customers, QuickBooks Online Advanced leverages the vast data and information within the QuickBooks ecosystem, applying artificial intelligence and machine learning, to serve up insights and patterns that help growing companies better run their business. QuickBooks Online Advanced provides an advantage for these growing and more complex businesses at an attractive price point, filling a gap not yet met in the market. Built on an open platform, businesses have access to hundreds of 3rd party applications, such as online bill pay and inventory management, that can easily be added and custom fit to meet their needs. QuickBooks disrupts and innovates by delivering a flexible solution that is tailor-made for businesses at this stage of growth, versus rigid mid-market software that overserve with the wrong functionality. In addition, QuickBooks Online Advanced includes Intuit’s premium service program, QuickBooks Priority Circle®. This personalized service provides a dedicated Customer Success Manager, a single and consistent point of contact ready to assist small businesses with their technical and product questions. 2—QuickBooks Capital, an innovative lending product that helps millions of QuickBooks small businesses get access to the capital they struggle to get elsewhere. Since launching, Intuit found 60% of QuickBooks Capital customers would likely not get a loan elsewhere, and 46% have never applied for a loan before. Working capital loans through products like QuickBooks Capital are especially important to underserved, young small businesses who often struggle to get access to traditional loans. Other lenders often rely on manual underwriting processes, which make it unprofitable for the companies providing the loan but more importantly often make the young small business under two years less eligible to apply for the loan. In fact, according to a recent Federal Reserve study, 70% of businesses younger than five years need funding to grow, but only 23% get the funds they need. Additionally, 90% of QuickBooks Capital customers said the funds they received helped them grow their businesses, and 41% say without a loan from QuickBooks Capital, they would not have expanded or improved their business. Increased loan amount and free access to business credit score and report: When Intuit initially announced QuickBooks Capital in 2017, the product offered loans up to $35,000 for small businesses. QuickBooks Capital now offers loans of up to $100,000 to small businesses with up to 12-month terms. Additionally, QuickBooks Online customers can now access their free business credit score and credit report through a new partnership with Dun & Bradstreet. Next articleAre You Prepared for a Data Apocalypse?